Finding the right pair of work boots that fit well, are constructed with care, and last a lifetime can be really tough. That’s why we did extensive research to find you the best pairs of work boots made in the USA. Everyone has different needs, so we split out our recommendations into popular categories like steel toe, waterproof, hot weather, and more. Below, you’ll find additional details on our top picks, what we liked and didn’t like, and our research methodology. Overall, we found that there were several American made boot brands that are making really high quality products. 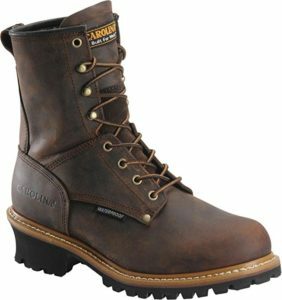 Carolina and Chippewa highlighted the traditional work boot categories with steel toes, waterproof material, and many of the consistent features you see with most work boots these days. We found that Thorogood is really making some incredibly comfortable work boots. And finally, Belleville and Corcoran were the standouts in tactical and field boots. Read more below for additional details on our recommendations! Here are some additional details on each of our top picks: product features, benefits, what we liked, what we didn’t like, and of course where to get them. Carolina has a great lineup of work boots with one primary attribute in mind: toughness. They even say it themselves all over their website: “Just. Plain. Tough.” Their Steel Toe Loggers Boot is no exception. Each boot has a supportive steel shank (located in the arch of the shoe) and steel toe. The outer material and high top is super supportive, and they don’t overload you with too much material so the boot stays lightweight. Ironically, despite the brand name, their headquarters is in Pennsylvania, which is the same place where they manufacturer each and every pair of their boots. 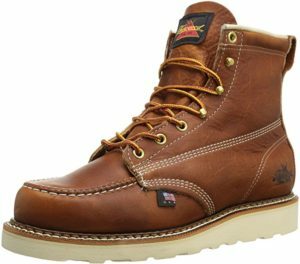 Waterproof and insulated, the Chippewa Logger Boot is a great choice for anyone who works in a cold, damp environment. 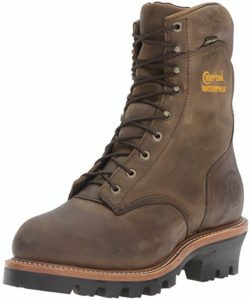 Chippewa developed a proprietary technology that they call Chip-A-Tex, which is a waterproof, but breathable membrane around the boot. Water is shut out, but air can still pass through. The inside of the boot is lined with Dri-Lex, a “moisture management” system of lining that makes the boot breathable on the inside and quick to dry. They also have insulation in there for when the weather gets cold. It tested best among other boots in our research for surviving frigid temperatures. These boots take a while to break in. Wear them around the house for a bit before wearing them on the job. The full grain leather Thorogood American Heritage Moc Toe Boot tested best in our research for comfort. What sets it apart from the competition is the construction of the insole and the outsole, designed for shock absorption and comfort. The insole is “dual density” which is just fancy words for essentially two layers for added support. Underneath the insole is a fiberglass shank, different from the steel shanks that you typically see in work boots. This makes the boot a little more lightweight and flexible. On the outside, the outsole is made of a synthetic material designed for durability and traction. The boot tested well on maintaining grip on slick surfaces. One last note: they run a little large, so you’ll likely want to order about a half size down. 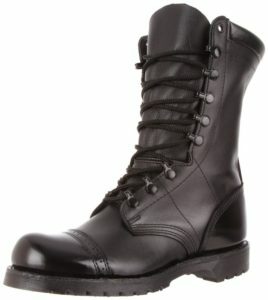 Belleville is world class at making tactical boots, particularly for hot weather. Pictured left is their minimalist training boot, designed for more natural movement and breathability. The Aero-Spacer mesh lining wicks away moisture at your feet and lets air flow in and out very easily. The bottom rubber sole, while more minimal than a traditional work boot, has almost the same amount of traction slippery surfaces. 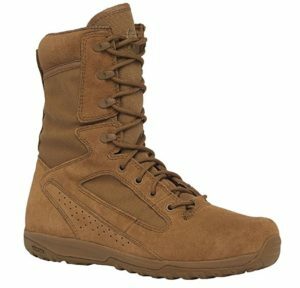 This boot is also AR 670-1 compliant, which means it is authorized by the U.S. Army. If you live in a hot and dry climate, this boot is a durable option for you to stay cool and get the job done. Corcoran was one of the original suppliers of army boots in World War II, and continues to make quality field boots to this day. This particular field work boot is super rugged and durable, two essential requirements for pretty much every boot that Corcoran makes. If you like firm boots with some extra support, these are a good option for you. The arch of the boot has a steel shank for even more stability. The Vibram outsole also grips well in a variety of different terrains. These boots are going to last you a long time and hold up well in a variety of conditions. Your work boots have to be durable to handle the wide variety of jobs you need to accomplish in them. We looked for boots that were made from high quality material, treated well, and had the proper construction to last long. Features like steel toes, full grain leather, steel shanks, thick outsoles, and laces that don’t fray were all things we valued. You’re often spending an entire day in your work boots before you get to kick them off – they need to be comfortable. Comfort largely stems from the construction of the insole and outsole of the boot. We looked for soft, breathable insoles that are going to form to the shape of your foot. On the outsole, shock absorption is really important. You want to be comfortable when you’re working, but you also need to be protected from unforeseen circumstances when dealing with heavy machinery and other equipment. Toe protection typically comes in three varieties: steel, aluminum, and composite. Steel is pretty typical, however they are magnetic and they conduct temperature as well. So, if you work around metal detectors of magnetized objects a lot, you may want to go with an aluminum or composite option. Same with extreme weather conditions – steel toes will simply exaggerate the cold or warm weather. Some jobs are just unpredictable. You need your boots to be able to adapt with you in all scenarios, whether is it hot, cold, rainy, muddy, or any other condition. Water resistance along the boot and traction control on the outsole were two major factors we considered here. The laces are an important part of any work boot. Although they can be easily replaced, laces need to be durable, waterproof, easy to handle, and have the ability to easily stay tied. We want to make sure that you’re getting the best work boots for your money. We made sure to weed out any boots from our analysis that didn’t pass our criteria for quality vs. price. If the price was too expensive for the quality you were getting, then we eliminated it. We think our top picks are some of the best value work boots on the market today. When it comes to footwear, several American born companies are cutting costs and moving their operations overseas. Unfortunately, cutting costs typically means cutting quality as well. Labor and materials are cheaper in China and other popular manufacturing hubs, so their manufacturing process often cuts out important protective features of work boots or lacks durability because of the lower quality material that they make their boots with. Now, this choice is typically not the one of the manufacturing facility (there are many capable companies overseas who use high quality materials in their products), but that of the main shoe brand who wants to squeeze out every drip of cost possible in their manufacturing process. Remember to read labels and product details to ensure your next pair of work boots are made in the USA!